Things to do today – Check your Google keywords! From today, Google have implemented a major change to their trademark policy in UK and Ireland. This change, brings the policy for these countries, in-line with that already used in the USA and Canada. The policy change effects the use of trademarks as keywords to triggered an Adword or Sponsor Link advert. From today, "keywords that were disabled as a result of a trademark complaint and investigation will no longer be restricted in the UK and Ireland." The practical effect of this change is easy to demonstrate. 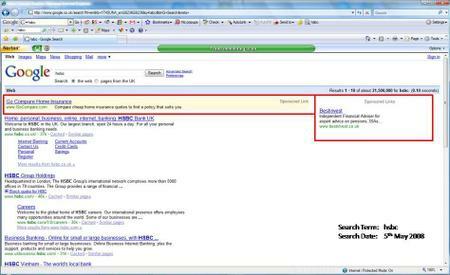 Yesterday, a search using Google, on the term "hsbc", returned only natural search results. In this case, returning results for HSBC Bank, with no Adword or Sponsored Link adverts. 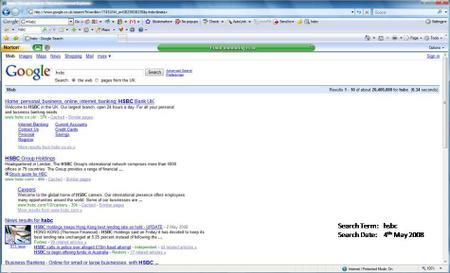 The same search performed today, returns Adword or Sponsored Link adverts for two independent sources of financial advise, "GoCompare.com" and "BestInvest", in addition to the natural search results. The policy change opens up some new and interest on-line campaign opportunities, as a company could now trigger adverts on a rival companies trademarks. Undoubtedly this is a clever move by Google, as it will obviously have a positive impact on their revenues. Trademark holders will now have to bid to protect keywords relating to a trademark. To make sure you are getting the most out of Google’s Adwords programme and to keep traffic flowing to your site, remember to check your keywords, today.